A few years back, as I was tweeting away about the ups and downs of being a single parent, Cyma Shapiro approached me and complimented my sincere posts. Then she honored me with the invitation to write for her mid-life mothering / parenting blog called Mothering in the Middle. Since I love to write, as it helps me put my thoughts and heart together as an outlet of expression, I accepted her offer enthusiastically. 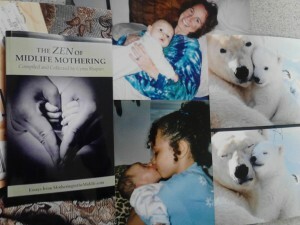 Little did I know what I was getting myself into, as not only have I published some impassioned meaningful blog posts, but Cyma chose one of her favorite blogs of mine to be placed in her published anthology called, “The Zen of Midlife Mothering“! I’m now officially published. On top of all that, Cyma has become a good friend and colleague, and I am so grateful to her for her passion to bring us midlife parents together, where we have a safe place to share our joys and our troubles. She was even interviewed in an article on CNN recently, giving Cyma the credit she so deserves, as she serves so many. On this note, please bookmark this page, or at least come back when you have a little more time, or sit back and enjoy right now! Here is a list of the blog articles that I’ve written for “Mothering in the Middle” since 2013. Please let me know below if you have any comments, thoughts or points of discussion on any of these blog posts. Look forward to hearing from you! 1. My Post-Valentine’s blog, “Love Thy Children, Love the World“, describing how we can spread the love to the world through the unconditional love that a mother feels for her child. 2. “How ‘Merry Christmas’ Upset Me (And How I Got Over It).” Fascinating read for all to see another perspective of holiday bewilderment! 6. “Bringing on the New Year with Vision,” go beyond resolutions and see your future! 11. Seasons Change and So Do WE! Go with the flow, my friend. 12. The Holidays are here! Are we focused on Presents or Presence? !